The rags-to-riches story of one of America’s wealthiest and least-known financial giants, self-made billionaire Kirk Kerkorian—the daring aviator, movie mogul, risk-taker, and business tycoon who transformed Las Vegas and Hollywood to become one of the leading financiers in American business. Kerkorian combined the courage of a World War II pilot, the fortitude of a scrappy boxer, the cunning of an inscrutable poker player and an unmatched genius for making deals. He never put his name on a building, but when he died he owned almost every major hotel and casino in Las Vegas. He envisioned and fostered a new industry —the leisure business. Three times he built the biggest resort hotel in the world. Three times he bought and sold the fabled MGM Studios, forever changing the way Hollywood does business. His early life began as far as possible from a place on the Forbes List of Billionaires when he and his Armenian immigrant family lost their farm to foreclosure. He was four. They arrived in Los Angeles penniless and moved often, staying one step ahead of more evictions. Young Kirk learned English on the streets of L.A., made pennies hawking newspapers and dropped out after eighth grade. How he went on to become one of the richest and most generous men in America—his net worth as much as $20 billion—is a story largely unknown to the world. That’s because what Kerkorian valued most was his privacy. His very private life turned to tabloid fodder late in life when a former professional tennis player falsely claimed that the eighty-five-year-old billionaire fathered her child. 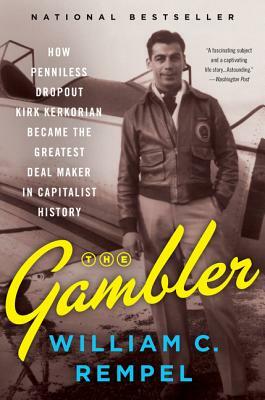 In this engrossing biography, investigative reporter William C. Rempel digs deep into Kerkorian’s long-guarded history to introduce a man of contradictions—a poorly educated genius for deal-making, an extraordinarily shy man who made the boldest of business ventures, a careful and calculating investor who was willing to bet everything on a single roll of the dice. Unlike others of his status and importance, Kerkorian made few public appearances and strenuously avoided personal publicity. His friends and associates, however, were some of the biggest names in business, entertainment, and sports—among them Howard Hughes, Ted Turner, Steve Wynn, Michael Milken, Cary Grant, Frank Sinatra, Barbra Streisand, Elvis Presley, Mike Tyson, and Andre Agassi. When he died in 2015 two years shy of the century mark, Kerkorian had outlived many of his closest friends and associates. Now, Rempel meticulously pieces together revealing fragments of Kerkorian’s life, collected from diverse sources—war records, business archives, court documents, news clippings and the recollections and recorded memories of longtime pals and relatives. In The Gambler, Rempel illuminates this unknown, self-made man and his inspiring legacy as never before. William C. Rempel is a veteran investigative reporter and editor who specialized in foreign and national projects. During a thirty-six-year career at the Los Angeles Times, he produced groundbreaking reports on subjects ranging from oil tanker safety prior to the Exxon Valdez disaster to the menace of al-Qaeda prior to September 11, 2001. He has received numerous journalism honors, including a shared Overseas Press Club Award for international terrorism reports and a Gerald Loeb Award for financial writing. He was also a finalist for the Goldsmith Prize for Investigative Reporting. “The Gambler is an excellent tour de force biography of a true rags-to-riches impressario… A class act of a biography! — CDC Gaming Reports, Inc.